Giclée prints surpass the resolution and archive quality of tradional fine art prints like lithographs and photographs. We are delighted to welcome you to the exciting new world of fine art giclée print making. Digital Camera Settings. Use the best digital camera settings for high resolution prints. Here's a short primer on file resolution, compression and important exposure settings. Print Processing. Make corrections to color balance, contrast and composition if needed. This step is included in our basic print package. Order Prints. Place your order and send digital images for print processing. Protect Prints. The proper matting, framing and storage of giclée print to preserve their beauty for at least 135 years. 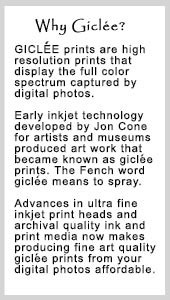 IONA Print Studio uses Epson Stylus Pro 7890 printers with archival Ultrachrome Vivid Magenta K3 Inks and archive quality fine art papers and canvas to produce prints that are colorfast for 70-100 years when properly framed and stored.